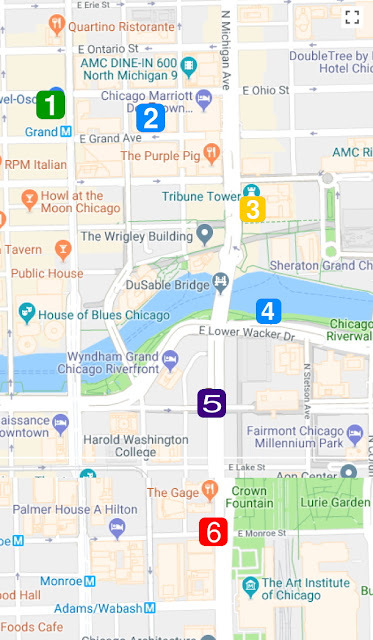 CWB Chicago: UPDATE: Cops Issue Flyer Boy Warning — "Do not engage in conversation with subjects in the roadway"
UPDATE: Cops Issue Flyer Boy Warning — "Do not engage in conversation with subjects in the roadway"
Map of incidents listed in today's police alert. Chicago police today issued a community alert to warn drivers about a series of thefts and robberies in the downtown area that have involved flyer boys. CWBChicago first told you about the crime pattern on Monday. Police listed six recent cases, but a department source said the number of incidents is much higher. In each case, motorists who are stuck in traffic have been approached by young men who distract the driver and may try to open the driver-side door, the alert said. The form of the distraction is often a ruse to deliver a handbill or flyer about a fake sports team or charity. Once access to the car’s interior has been achieved, the offenders take cellphones—often from window mounts—and other electronics such as GPS devices. All of the incidents listed in the police alert were reported during afternoon or evening hours, and many were on or near Michigan Avenue. CWBChicago reported on Monday that drivers for ride-hail services are frequently targeted because they often mount their phones on the windshield within easy reach of someone standing outside of the vehicle. One of last weekend’s cases involved an Uber driver who told police that a flyer boy approached her car at Michigan and Randolph around 4:30 p.m. Saturday. After pretending to hand the woman a flyer, the thief suddenly displayed a handgun and took the woman’s phone, mount, and base from the car, police said. The police alert said the offenders are African-American males between 15- and 20-years-old. Cops are encouraging drivers to keep their doors and windows locked at all times. Conversation with people in the roadway should also be avoided, police said. Anyone with information about the crimes is asked to call Area Central detectives at 312-747-8380.